Beagle Characteristics: The frisky and companionable Beagle is a breed of small dog classified as a member of the Hound Dog Group (AKC:1885), a Scenthound. The Beagle, is characterized by its sturdy appearance with a smooth, powerful head with an alert and appealing expression. Other characteristics include large hazel or dark brown eyes; long, pendulous ears; a straight and level back and a firm, straight gait. The temperament of the Beagle can be described as Lively, Friendly, Independent. The coat type of the Beagle is described as hard and coarse coat in assorted colors. Due to its characteristics and qualities, the Beagle demonstrated the desired traits of a Hunting Dog and is known by its nick name the "Snoopy Dog". The Beagle has a distinctive howl or bay when they are on the hunt. The origin of the Beagle dog breed was in United Kingdom where it was developed in the 1500's. Beagle Breed Group and Dog Type - Hound Dog Group (AKC:1885), a Scenthound: The Beagle is one of the many breeds of dogs that belong to the Hound Dog Group (AKC:1885), a Scenthound. Other names for the Beagle: The Beagle is known by the nickname of the "Snoopy Dog". Other names for this breed of dog include the English Beagle. Origin of the name: The origin of the name "Beagle" derives from the French word 'becguele' meaning "noisy person" in reference to its loud barking. Beagle - Scent hound: The Beagle is a Scent hound, one of the hunting dog breeds, built for endurance, with deep, open nostrils that enable the canine to pick up scent particles and track small game, especially hare and rabbits. Beagle History and Origin: The country of origin of the Beagle breed was in United Kingdom during the 1500's and descended from the now extinct, 'Southern Hound'. The Beagle looks similar to a mini English Foxhound and was probably developed from this breed and as a smaller version of the Harrier. The Beagle was commonly utilized in pack hunting. One of the earliest descriptions of the Beagle was in the book "House Dogs and Sporting Dogs", published in 1861 by John Meyrick, who described three different types of the breed that he referred to as the Common Beagle, the Rabbit Beagle and the Wire haired Beagle. The Common Beagle was the largest with "fine scenting powers...and their slow pace". The smaller Rabbit Beagle, predominantly used for rabbit hunting as opposed to fox hunting. The even smaller Wire haired Beagle was described as "a cross between the Common Beagle and the Terrier" and made "an excellent retriever" which because of its smaller size was "far more manageable". The breed that John Meyrick referred to as the Common Beagle is the ancestor of the modern Beagle and it was taken to the 'New World' in the early 1700's. The Beagle was officially recognized by the American Kennel Club (AKC) in 1885. Beagle History - The Snoopy Dog: The Beagle was used by cartoonist Charles M. Schulz as inspiration for "Snoopy the dog", a cartoon Beagle from the long running comic strip "Peanuts". Snoopy the dog is generally drawn sitting on top of his doghouse imagining himself in sensational roles, famously including a WWI flying Ace and as an astronaut flying to the Moon. In 1969 the real astronauts of NASA's Apollo 10 lunar mission went on to include the names of the Peanuts characters Charlie Brown and Snoopy as the mission's call signs. Charlie Brown and Snoopy became Apollo 10's semi-official mascots. The Silver Snoopy award is still given as a special honor to NASA employees and contractors for outstanding achievements. Snoopy the Dog has become the most famous Beagle in the world. Beagle History - Shiloh (1996 movie) and John Wick (2014 movie): The 'Shiloh' movie features "Shiloh", a young Beagle who is befriended by Marty Preston (played actor Blake Heron). This heart warming Warner Bros. Family Entertainment film featuring the Beagle proved to be a great favorite with both kids and adults. In the 2014 'John Wick' movie, Keanu Reeves plays a retired hitman who goes on a rampage after the demise of his beloved Beagle is killed. Beagle Modern History: The modern history of the Beagle moved on the dogs fine scenting powers now used by police and other law enforcement agencies to sniff out explosives and illegal drugs. The breed is enjoyed as a family pet, although it is fair to say that it can cause disturbances with its loud bark. Beagle Height: The Beagle breed is classified as a small sized dog. The height to the shoulder of a male Beagle dog is 14-16 inches (36-41 cm). The height to the shoulder of a female dog is 13-15 inches (33-38 cm). Beagle Weight: The weight of this small sized dog, in a male dog is 22-25 pounds (10-11 kg). The weight of the smaller female dog is 20-23 pounds (9-10 kg). Beagle Coat Type - LOW shedding coat: The coat type is described as hard and coarse coat. Beagle Coat Colors: The colors of this dog breed consist of assorted colors consisting of Brown & White, Orange & White, White & Tan, Red & White Tri-colors and bi-colors, often with distinctive white feet. N.B. The term "Red" refers to reddish shades of orange, brown, and tan colors. Beagle Grooming Requirements - LOW Grooming Needs: The grooming needs of the Beagle are categorized as Low in order to maintain a healthy, tangle-free coat and reduce the risk of skin infections. The limited grooming needs of the Beagle are considered to be low maintenance, requiring limited attention to grooming where brushing and combing, is concerned. Grooming Requirements should include bathing the dog on a monthly basis and making regular inspections of the nails, teeth, eyes and ears. Beagle Litter Size: The litter size of this dog breed ranges from 2-14 puppies. Beagle puppies for sale can be obtained reputable breeders and from rescue centers. The cost of Beagle puppies varies depending on location, pedigree history and the dog breeder. Beagle Temperament and personality: The temperament and personality of this popular dog breed is described as Frisky, Lively, Friendly, Independent and Companionable. Beagle Exercise Requirements - MODERATE Exercise Requirements: The exercise requirements of this breed of dog are moderate. The lively Beagle requires regular daily exercise consisting of approximately 1 hour to 30 minutes every day. Beagle Diet: A fully grown Beagle should be fed twice a day. A diet consisting of a premium dog food can be balanced with fresh food eaten by the family. The question is What Can Dogs Eat?. Check out our comprehensive list of what dogs can and what dogs cannot eat. Beagle Health Problems: Potential health problems of the Beagle breed include Glaucoma, Hip and Elbow Dysplasia. Resolving health problems can prove to be expensive and it is always wise to obtain pet insurance or dog health insurance when buying a dog. Is the Beagle dog breed said to be Hypoallergenic? Answer: No. 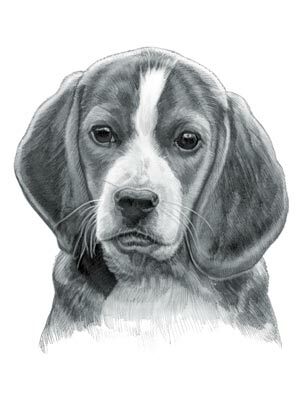 Beagle Lifespan: The life expectancy of dogs vary according to the size, breed of dog and any serious health problems. The typical lifespan of the Beagle breed is 12-15 years. Beagle Male Dog Names: Male Dog names are most often chosen to reflect favorite names of the owner or the strength, size, coloring and country of origin of the Beagle breed. To give you some inspiration regarding good male Beagle names our small selection might be of help with naming boy dogs. Our top male dog names are: Nipper *** Foxy *** Bugsy *** Rascal *** Peanut *** Squirt *** Stumpy *** Tiny *** Titch *** Pip. Beagle Female Dog Names: Female Dog names tend to be softer, prettier and reflect the temperament of the girl dog. Our top choice of good female Beagle names are Coco *** Annie *** Daisy *** Lucy *** Rina *** Kissy *** Sadie *** Babydoll *** Hiccup *** Tootsie *** Bambi.